The Lady Banks rose I planted growing up the column on my porch. Last summer, I planted a yellow Lady Banks Rose (Rosa banksiae) to grow up the column of my side porch. Lady Banks is a thornless climbing rose that explodes in clusters of miniature white or yellow blossoms in the spring, and it’s what we gardeners call a “vigorous climber.” That means that the thing is on the fast track to taking over my porch (and possibly my entire house), a slightly overwhelming prospect that is tempered only by the breathtaking display of flowers dripping from the soft, green branches. Simply put, it’s gorgeous. My Lady Banks rose only one year after planting! Climate: Hardy to planting zone 7. Soil: Moist, well-draining, with lots of organic matter added to the planting hole. Otherwise it is not picky about soil types. Water: Water regularly until established, then it shouldn’t need a lot of extra irrigation except in severe heat or drought. Blooms: Single or double, white or yellow miniature blossoms in spring. Blooms only once per year. Size and Pruning: Lady Banks blooms on old wood, so be careful not to over-prune the older branches. You’ll be busy enough trying to contain the size of this rose – it’s not meant for small spaces and easily grows to 30 feet or more, quickly swallowing sheds, trees, and unaware bystanders in its path. In fact, the largest rose in the world is a 100-year-old Lady Banks in Tombstone, Arizona. Check out the amazing Tombstone Rose that covers more than 8,000 square feet! I may regret planting Lady Banks so near the house, but it’s such a pleasure to walk under the blossoms when I enter and leave my kitchen door. The scent is very subtle, and the vine itself is a delicate, eager bundle of vitality growing visibly larger by the day. To find out more, check out Lady Banks Rose Update. My childhood home had a lady banks rose growing up the chimney- It was 30 ‘ tall & at least 15’ wide. Probably was 30 years old. It is outstanding! I planted one on my back fence to ramble up trees about 3 years ago. Hoping to have blooms this spring. Crossing my fingers ! My Lady Banks Rose Bush blooms 3 times a year. I live in SC. I read in the article that it only blooms once. Maybe in some regions but not in Charleston SC. I live in Burleson, Texas. Would like to know where in my yard would be a good place to plant a Lady Banks Rose. My 25 year old Lady Banks and I have a yearly fight going. After she blooms, I attempt to prune the extremely long new branches and for every one I cut, she grows 3 more just as long. LOL! Not really, but it sure seems that way. I have two Lady Bankston Roses growing over my patio. The blooms are beautiful . This past year the leaves are continually dropping even the new green leaves. They bloomed this month with very few blooms. What could be wrong with these Lady Bankston Roses? I fertilize and water them well. Here is this years bloom–2017. I just got a sad LB rose at Lowe’s markdown shelf. I want a climber for my garden gate entrance to shade garden. But after reading the comments I think this one is going further away from house on a fence that will run between lawn and orchard. So it can grow to it’s heart’s content. I have 5 LB roses only in yellow I could like to know where can find different colors. L love my LB roses a lot of complements. I live in Wetumpka Alabama and my Lady Banks thrived the first few years after I planted it six or seven years ago, but the last couple of years it has been thining and spindly with fewer blooms and leaves each year. What do I need to do to save it? We thought cut it back, fertilize it, we don’t know what to do because we don’t know whats gone wrong with it. Nothing has changed from the years it was amazing. I am in New Mexico, I have seen the LB rose for sale at Westlake in the early summer. I have seen they come in yellow and white most commonly, however, I have also seen a RED one. I would like to obtain all three colors to train on my pergola. How old does the yellow Lady Banks need to be to flower? We live in Okmulgee Oklahoma and it is growing great but after two years no flowers. Over here in the UK, it’s common to see the yellow variety planted beside a wisteria. They both flower at exactly the same time and the two colours together- violet and pale yellow- work beautifully intertwined. Lady Banksia rose, planted on a fence, but also is a walkway into the courtyard. Sounded like it was going to be perfect spot. However, after reading the comments, and viewing the photos, I have gotten a bit concerned she will prevent passage in no time! Too late to move? Also, I have a 3 sisters rose near that may be over taken, which I prefer not to happen. Can I move the Banksia? Been planted less than 2 years. Waterfall effect. No pruning yet. Your Lady Banks rose is spectacular! Thanks for sharing the link. Thank you for your beautiful remembrance of your parent’s Lady Banks rose. I hope your new one continues to grow and flourish. I remember one of us siblings having to take turns hauling a watering hose what seemed like daily from the house all the way out to the side of the road where the LB was planted. I remember thinking: why are we (children) having to drag this hose all the way out here, and the hose is barely dripping water! Little did we know then, the water was slowly trickling, and receiving an all-day soak. The LB would get a good trimming for the first approx 3-4 yrs. After that, it was never manually watered again and it was the most beautiful, heavily blooming LB I have ever laid eyes on. It was planted in the ground; no trellis, post, etc. Our father would trim it into the same shape every year, i,e, trimmed into a ‘perfect’ round bush. By doing so, it was very dense, thick and loaded with the prettiest yellow clusters – it was kept low and bushy. I’d guess it was approx. 10′ wide and trimmed down to approx. 3-4′ high. Passer–by’s would actually pull into the drive way to ask what that beautiful plant was. Unfortunately, I never appreciated it’s beauty until both parents passed. My mother passed in 1998, father in 2007. When he passed, it was still going strong with no effort put into it what-so-ever. We recently sold ‘our’ home we grew up in, and I had to take 1 more drive by it – especially to see how the LB’s was doing. It, unfortunately, was a goner…My father passed due to complications with Alzheimer’s, therefore the LB went for approx. 9-10 yrs with no maintenance. The house sat empty until it sold recently and we have no idea what happened to it. I was going to cut some pieces off of the ole beauty but I was too late. Isn’t it funny how badly you want something once it’s gone? Well, I got on-line and started searching for LB plants near-by. No luck. I ended up buying a very small – approx. 6″ high, barely-rooted ‘piece’ placed in a small pot from eBay and it is growing like crazy. I have it in a huge pot where it receives approx. 3 hours of sun (at most) a day. I hope to be able to post pictures of a beautiful, blooming Lady Banks Rose soon! Last winter I saw a beautiful yellow rose covering a trellis and fence in Sedona AZ. (we were there on vacation) Later I found a potted Lady Banks for sale at an Ace Hardware with the very same blooms and leaves… so I bought it and brought it home to my rose garden here in Colorado Springs. It is growing beautifully. I have quite a few other roses… so am familiar with how to grow them. But do not know if Lady Banks spreads…. or sends out shoots that come up a few inches or feet away from the mother plant. Can any one tell me? I am hoping she will do well in our zone 5. TIA ! Thanks as it is just what I needed to hear. Bonnie, It will grow tall, but you can prune it, or weave it into the trellis. I am thinking about planting a lady banks rose for my steel trellis. The trellis attaches to the facia of the house but am wondering how tall does this lady banks rose get? Will it present a problem as it is to be an arbor/walkway/protection from the sun coming into my dinette? any comments would help. thanks! My Lady Banks is nine years old and grows on an iron fence (4 inch diameter). It is about 20 feet wide and 10-12 feet high. It hasn’t produced the amount of blooms the past two years as it has in the past. I’ve always used organic fertilizer and nothing has happened to the water. Any idea why the blooms are less? I would like to get a cutting and start another one in another area. Is there anything special I should know about starting cuttings? Thanks you. I got A Yellow Lady Banks last year in March, planted it no blooms, growing very well, no blooms yet this year gets a lot of sun, what should I do to get it to bloom, anyone know what I need to do I live in Benton, Arkansas my e-mail address is jecsgrandma@att.net would love to see some blooms!!!!!!!!!!!! I weave the young canes of my yellow banks rose through the lattice, I usually don’t need to tie it up. this is the second year for my lady banks, last year it started out growing really fast, I tied the branches to the trellis with cloth, it turned brown and the leaves died, this year started growing again and I tried it again all the leaves starting turning brown again, how are you to keep the branches on the trellis? Regarding Yellow Lady Banks roses , I live in zone 5 here in Southern Ind. and cut my banks back hard every other year and it is the best rose I have EVER owned. It is a very easy and beautiful rose and is truly thorn less. Love it and recommend it to anyone. A must have climber. I have had a yellow, double Lady Banks Rose for 7 or 8 years. My courtyard has a slatted open cover. The rose grew to partially cover the cover and was beautiful blooming and provided shade to the courtyard. 3 winters ago we had the coldest winter since we moved to New Mexico in 1984. I thought I had lost the rose (but think I should have watered it more often) as it appeared to have died. Low and behold it started growing from the base of the trunk and now 3 summers later, is starting over the courtyard cover and full of buds. Love it!! Just planted two small LB bushes to climb fence line across back of property here in Greenville, SC. Are these plants fast growing after established ? Thanks. It’s spring time in Las Vegas. Our Lady Banks Rose, 2014. I thought someone would respond to my question about growing a banks in north east Ohio? I have a Lady Bank and am having to have it dug up. It has completely taken over my backyard and over the fence in my neighbor’s yard. I had no idea it would grown to such an enormous size. This rose bush needs an enormous amount of space to grow. In Georgia north of Atlanta,I planted 4 lady banks in very large pots on the upper deck of our home. I trained them to grow in a tree structure and they cascade like a fountain with their beautiful flowering yellow roses. It is a spectacular sight. They are about 6 ft tall and they spread across about 5 to six feet. I have the main stock tied to round metal rods about 7 ft tall. I do prune them in fall. I want to give them the correct fertilizer which would not burn the roots in the large pots. Any advise what is best? Will a lady banks rose grow in NEest Ohio. Zip code 44666? I live in Southern Indiana and have had my LB for for 10 years. She’s on the S.W. corner of my house with partial shade. The rose is a show stopper every year. I prune it back in the fall and thats about it. Don’t water, feed, or spray it.. She does just fine. Love the true thornless quality and beautiful foliage. I bought an LB that had been reduced from 26.99 to 5.99 it immediately perked up after it felt the earth under it’s feet.I know it will only bloom one time in a year,I think it will be worth the wait.Shelby N.C..Zone 7 but almost an 8.I will post a photo when she blooms. Love the Lady Banks rose. Just bought one and planted it next to one of the columns on the front of my house. After reading this blog, I wonder if I’ve made a mistake by planting it there. Will it overtake the front of my house? The nursery where I bought it didn’t mention how big it gets. In fact, I am a huge wisteria fan and in talking to the sales person, mentioned that I wouldn’t buy one because I didn’t want it to overtake my yard! They never mentioned that LB could do the same thing. I had a Lady Banks back in SC. It was at the front of my yard planted against a split rail fence. It never climbed anything instead it grew up and out like a fountain. It grew so large it covered about 1/3 of the view of the street which was very wide. A neighbor I ran into at the grocery store asked me one day if I still lived on Lantana St behind the shrub. Now living in Ohio 25 miles south of Cleveland I would love to have another . Is that possible here with the temp so cold ion the winter and also we are on a hill and get wind all year long….. Still can’t find anyone here in Mobile, AL, that has Lady Banks. Any help on where to get one for my yard? Also looking for a Tea Olive! Ours does not shed a lot. It just keeps growing and growing. Your help would be greatly appreciated. Forgot to check the box for e-mail comments. Thank you so much for any help you can provide…we love this rose! We planted our white Lady Banks Rose three years ago next to our deck and it bloomed profusely last year and again this year. My concern is that after blooming it sheds a lot of the foliage. Is this normal? I can’t seem to find a Lady Banks for sale in the Mobile, AL area. Can you help? I live in northeast Ohio and want to plant a lady bank rose. Do you have any recommendations? Here is an updated photo of our Lady Banks climbing rose–5 days after my first picture 2 posts above. I enjoy this web site! A lady doctor friend was given a bucket with 5 cuttings from what looks to be a Lady Banks (from the leaves on the cuttings0, all were stuck in a pot of good soil. Can I leave it in there or should I dip cuttings in growth hormone, and then bury again, how deep, or put in water, Help! Our Lady Banks rose is in full bloom and looks great! Julie, Thank you for the nice info! growning in the corner of our backyard. It’s has long branches going every which way. I would like to take a cutting and start a new LB rose in a better location. Also get a cutting for a friend. HELP HELP!!!!! Around 5:30 pm today, I noticed my Lady Banks rose “crying”. It’s largest canes seem to be weeping droplets of water/sap. The sun is directly upon the shrub but I’ve never noticed this before. It is aprox. 5 yrs old now. Is this something to be concerned with? I want to plant a climbing rose at the corner of my house, possibly new dawn that I understand can grow to 20 feet tall. I have a brick house and am not sure what would be the best type of support. Like Diana Schnitzlen, my lady banks rose has much growth, but no blooms. I have it on my deck and it gets alot of afternoon sun. When does it bloom….North Carolina area. ? I planted this rose last year and it has completely covered my garden arbor, but I have not gotten any blooms. It is June 1 – is it too late for it to bloom here in NC this year. My lady banks were looking beautiful and even put on a few roses (not getting enough sun yet), then two weeks ago when we had a humid spell here in North Texas, my Lady Banks developed powdery mildew. I have sprayed with a product recommended by a local nursery. Has anyone had this problem before and what should I expect? Will those ugly leaves drop off? Thanks for the feedback on your Lady Banks roses! I planted my first Lady Banks about 6 yrs ago against my house by my pool. Not knowing anything about roses. Well it has covered the wall completely. Had it on small iron trellis at first and it got so top heavy my husband built one out of heavey steele and bolted it to the wall. I keep it trimmed now into an almost round bush, it was spreading sideways and upwards. When it blooms it is unbelievabley beautiful. I also have one over an arbor going into my flower garden, it is doing well. Planted one yesterday to drape over a bare wall by my pool. I live in west Georgia and these Roses grow well here. Oh! I forgot to mention her dimensions. She’s well over 20 feet high and 15 to 20 feet wide. Her trunk is a diameter of 8-10 inches at her larger spots. She’s about ten years old. She’s a fragrant yellow. Thanks again. Desperate for any advise. Hello. I too am a huge fan of my Lady. She’s beautiful and enormous! But I have a big problem. She has GOT to be moved. She has gone through two trellis’ and a steel arbor in ten years time. Swallowed them all. Ripped brackets from the brick. She is now supported by a make shift brace my husband made for her out of ten foot 4×4’s. It’s crammed up underneath her. For two years I have struggled with the idea of what to do. I broke down and called Tombstone Arizona for advise. I was fighting back tears when the woman told me that I will kill her if I try to move her. She said to cut her back. Ok yes…I get that. I prune her regularly through her season and sometimes in the winter when her branches are easier to get to but this does not solve my problem. Our house can no longer take her weight and the trunk, as you know, will be huge with more years. Is this true? That I will kill her if I try to cut her down to a manageable size and try to relocate her to the back yard where we had plans to build a massive brace for her. I can’t bare the thought of losing her but she cannot stay where she is. Any advice? I have two Lady Banks Roses. Both were moved from my previous address to Northeast Texas. One was injured from a fallen tree limb and I didn’t think it would make it since it happened during the extreme heat last summer. I cut it back and watered it as much as I could and it has survived. Both rose bushes do not climb, they fountain into a beautiful flow of yellow. I planted Rose Lady Banks last Spring/Summer. They have grown very well. My question: Why are they not blooming while others in my development are in full bloom (they have been planted for about five years)? Also, I read that RLBs do not have thorns, mine do. I live in the Dallas area and they do well here. Granted, most of the bush is new growth but there is some at the bottom of the trellis that are old growth. Help! We are building a deck and covered patio and have to remove the Lady Banks Rose Bush I have because it will be in the way. It is too large to dig up and replant. Can you tell me how to take a cutting from this bush and get it started somewhere else in my yard. Any help is greatly appreciated. I live in the chicago area with my backyard facing north I am having a couple of trellis made and would like to plant a flowering vine. I do not get any sunlight in the area that the trellis will be put. Would climbing roses work? Most everything I have looked at requires some sun. There is absouletly no sun in that area. Please help…. I would like a vine with a flower. I am open to any suggestion that you might be able to offer. I live in Austin Texas and planted a lady bak 2 years ago. I have had no blooms and my vines seem to be stretching outward instead of upward. What am I doing wrong? It looks healthy and growing vigorously. Just not growing upward growing outward, looks like a spraying water fountain! We’re in Cabarrus County and our Lady Banks has been growing well for about 7 years. It is absolutely beautiful in bloom. You shouldn’t have any trouble with it in Charlotte. 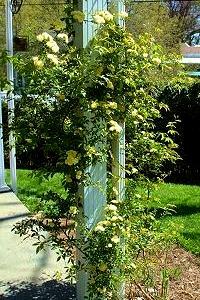 We were recently at the Norfolk, VA Botanical Garden and admired a yellow lady banks rose on a walkway arbor. We live in Port Huron, MI which needs zone 5 hardiness. Is there a comparible rose plant that we could use? Hey Cheryl Prince my mom bought hers down at Kingston, Oklahoma and the lady said to cut it down and fertilize the plant and of course water. My mom is already seeing green leaves down at the bottom. If you ever get down to Lake Texoma stop at Betti’s Nursery in Kingston you will be amazed by the Lady Bank’s plant it is so pretty. The dead part needs to be cut like a normal rose. Good luck!! We live in Edmond, Oklahoma, about 35 miles north of Norman and are experiencing the same results with our Lady Banks. There appears to be a new shoot at the bottom of the trunk but the rest of the tree looks dead. We’ve had cold temps and drought. What should we do? WE planted a lady banks last spring, summer. It did well last summer. We had some extreme cold this winter, it got to ten below zero -we live in Norman, OK. It does not look well – it is March 20. Many of our plants are greening up, the lady banks does not have any new leaves, buds, etc. Do u think the extreme cold could have killed the lady banks? Is the Lady Banks an evergreen? Just wait until you’ve have Lady Banks for three years. It is unbelievable. Our two plants have encompassed an 8 ft. tall metal trellis in three seasons of growth. They started quite small (2 ft.). Thinking seriously of buying another trellis to hold the weight of next year’s Lady Banks’ roses. I recently visited Tombstone AZ and saw the worlds largest rose bush it was a Lady Banks. I bought a start in a 1 gallon container carried it home and found out it is hardy to zone 7 I am in zone 5. Can I grow it in a pot and bring it into the garage for the winter. Any ideas for growing it in this climate will be greatly appreciated.